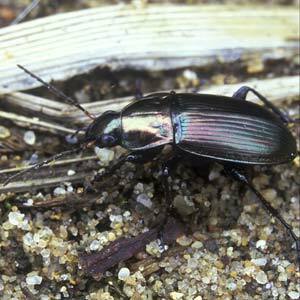 Description: 9-12mm long green or brassy to reddish, often bi-coloured, diurnal ground beetle. Usually found living in dry grassland, (heaths, downland, clifftops etc.) or bare sandy places. Widespread but local. World Distribution: A Eurasian temperate species (75) found across the whole of Europe, except the south and extreme north, and Siberia to the Pacific coast. Irish Status: Locally common and much less rare than P. cupreus in northern counties. In Britain, it is less common than P. cupreus in southern England, but extends locally much farther north into Scotland (Luff, 1998). Ecology: Less thermophilic than P. cupreus, but like that species day-active and often found running in warm sunshine. Generally recorded from wetter habitats, including peatlands, but also known from arable land in Europe.